I have always been critical of Superman. Even as a kid, I wasn’t THAT impressed by the last son of Krypton (I was more of a Spider-Man kid). The idea of this perfect specimen, with every super power in the book, didn’t catch the interest of a kid who saw himself as far from perfect. It took me years, almost 15 of them to be exact, to get to the point where I could appreciate the effect that Superman has had on our world, and really enjoy a comic featuring him. Now I am near 30. I consider myself well versed in all things comics. I still sometimes balk at how perfect Superman can be portrayed, but I definitely enjoy a good book with the boy scout (All-Star Superman is one of my favorite comics if you can believe it). Which brings us to Action Comics #1000, a book 80 years in the making. It is an anthology of stories from a variety of teams, all centered around Superman or his influence on the DC universe. Every story brought something different to the table. Every story focused on a different facet of what makes the man of steel so important, not just to comics, but to our collective moral consciousness. The stories were fun, unexpected, and heartwarming. I could break down every one, but we’d be here a while and I want to leave some mystery for you if you haven’t grabbed a copy yet. So I’ll talk about one. 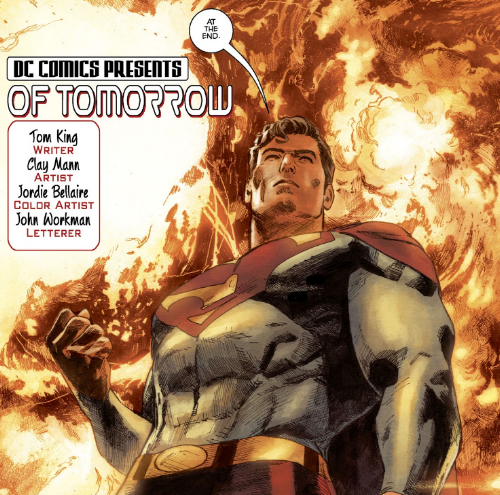 Which brings me to Tom King, Clay Mann, Jordie Bellaire, and John Workman’s addition to the super book, “Of Tomorrow”. I have become a Tom King super fan over the last few years. Every character he’s tackled (including my beloved Swamp Thing), he has done great things with. And Superman is no different. The story is simple: Earth is about to be destroyed. Not by a great cosmic evil, not by an inter-dimensional monster. This is the far future, and Earth’s time is up. The sun is expanding and will consume the little blue marble, and Superman feels it is time to let it go. The planet has been abandoned for billions of years, no life will be lost, but Clark is there to say one final goodbye at the resting place of his adopted parents, Martha and Jonathan Kent. To thank them for everything they taught him, and tell them how much he loves and misses them. This story tore me apart. It was five pages. Just five. We only see Superman straight on for one page. Yet I was an emotional wreck at the end. As a son, and a husband, and a father, I hung on every word, re-read every panel, and sat in silence after it was done. The story was great. It made me want to go back to that little boy I was and say “I know he seems perfect, but he’s not. And that’s ok. Give him a chance.” It made me want to call my parents and tell them how important they are to me. It made me want to pick up my daughter and hold her for as long as possible. On the final page, Superman says a line that, in my opinion, is one of the greatest I have ever read, seen, or heard. “We’re all stardust fallen. And we so we look to the sky. And we wait to be reclaimed.” We are connected by the words of an alien who lost his world, adopted ours, and defended it until the end. In a world where division is all around us, based on invisible lines we’ve created for ourselves, leave it to the original comic book super hero to try and bring us together.